Approximately 1.6 million people live in both urban and rural Santiago, and approximately 41% live below the poverty line. The need for affordable medical care in the Dominican is paramount. The public hospital system requires patients to pay for their own medical supplies, procedures, and medications. This is an expense that the majority of individuals living at poverty level cannot afford, and therefore many people in the region suffer and even die, from conditions that would otherwise be easily treatable. 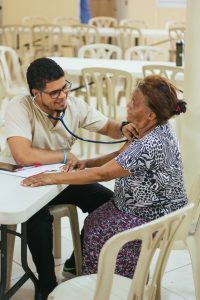 A daily general clinic in Hoya de Caimito, Santiago serves hundreds in the community and receives and treats patients from 31 other communities GO partners in. Each patient pays a mere 50 pesos, just over $1 US, to be seen by the doctor and receive any needed medicines, wound care, splints, or injections. In 2017, the clinic served nearly 4,000 patients. We currently have one physician, two nurses, and a pharmacy tech on staff to serve. Along with providing basic medical services, the medical center will be able to offer specialized services such as dental and eye care and provide managed care for chronic conditions. The center is equipped with four examination rooms, a pharmacy, a laboratory, a dental examination room, an eye care room, a minor procedure room, and radiology. The second floor provides private rooms to host visiting volunteer medical personnel to provide specialized care. The third-floor houses dormitory space to facilitate visiting medical teams that travel from the states to serve in the Dominican Republic. In partnership with North American doctors, medical professionals and medical teams, thousands of urban and rural poor are served each year through GO mobile clinics. These 2-3 day clinics travel to rural communities to evaluate and treat the sick providing free medications and vitamins. In 2017, 4,100 patients were treated through mobile clinics. To lead a medical team, click here. Opportunities for health education in partnership with local hospitals and local churches arise on a monthly basis. The GO Medical staff and visiting medical professionals prepare materials and presentations to educate fellow medical professionals and offer preventative presentations to educate the community how to live a healthier life. We know that we are stronger together. Be a part of making a Global Medical Impact by being a part of our team! For only $2,200/month, 9 professionals are able to serve the sick each day at the clinic. Become a part of our GO Medical Partnership Team by supporting their efforts monthly. One way to do that is to donate one shift per month to provide the salary of one of our medical team for an entire month! You will receive a customized retractable name badge holder you can wear once a month to share the stories of our GO Medical team serving in the DR. Join our team today! Recruit medical professionals who long to make a global difference! These 2-3 day clinics travel to rural communities to evaluate and treat the sick providing free medications and vitamins. Find out more information here. With more medicines we are able to treat more patients. One-time or recurring gifts help us purchase much needed medications. Help us purchase much needed medications here.